Kansas City, MO, April 03, 2018 --(PR.com)-- Custom Truck One Source (Custom Truck) has entered into an exclusive partnership with Tornado Global Hydrovac. The new partnership positions Custom Truck as the single distributor for Tornado products in the United States. “We’re proud to partner with Tornado and excited about this relationship that equips us to provide a more robust and diverse offering of Tornado products and services to our customers,” said Fred Ross, CEO of Custom Truck. As part of the partnership, Custom Truck will increase their Tornado fleet and will offer parts and services throughout all Custom Truck locations. “We’re expanding personnel, adding hydrovac specialists that will train our locations to provide exceptional service for Tornado products, as well as all OEMs,” said Paul Brouwers, Custom Truck Hydro-Excavation / Vacuum Product Manager. The Tornado ECO LITE hydrovac truck boasts many features, designed to meet the demands of today’s industry. Boasting less weight and top-notch safety, ECO LITE helps eliminate worries of accidents, fines and wasted time. Tornado products are easy to maintain, using off-the-shelf components. Customers can further capitalize on this partnership with flexible, customized leasing and financing solutions through Custom Truck Capital. Custom Truck One Source is the first true single-source provider of specialized truck and heavy equipment solutions. With sales, rentals, aftermarket parts and service, equipment customization, remanufacturing, financing solutions, and asset disposal, our team of experts, vast equipment breadth and integrated network of locations across North America offer superior service and unmatched efficiency for our customers. Learn more at customtruck.com and keep up with us on Facebook and Twitter. 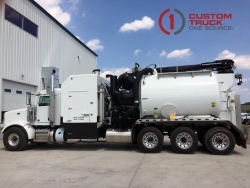 The Company designs and manufactures hydrovac trucks in Canada and sells hydrovac trucks for excavation service providers to the oil and gas industry and the municipal markets in Canada and the USA. Hydrovac trucks use high-pressure water to pulverize soil and turn it into mud, and then vacuum up the resulting mud into its tank. Tornado currently operates in North America. The Company intends to expand its hydrovac business into China and has established a wholly owned operation in China with a head office in Beijing. For more information about Tornado Global Hydrovacs Ltd. visit www.tornadotrucks.com.